Kevin Curran raised the money by driving his vintage tractor Betsy across America’s Route 66 in memory of his wife. Kevin Curran raised over €20,000 for the charity in memory of his wife Eileen. 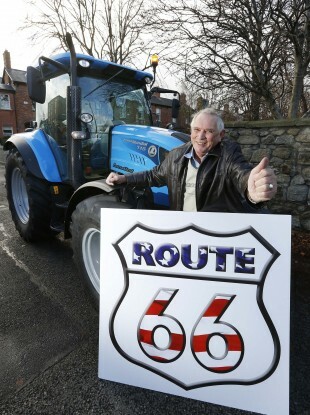 A KERRY SHEEP farmer has raised almost €25,000 for the Irish Cancer Society by driving his 50-year-old vintage tractor Betsy across America’s famous Route 66. Yesterday Curran presented the charity with the money at the Irish Cancer Society Research Awards Ceremony in Dublin at which 9 new cancer research grants were awarded. Curran and five friends decided to raise the money in memory of his wife Eileen who named the vintage tractor. Speaking to TheJournal.ie Curran said his wife contracted lung cancer in 2000 and had a lung removed. “She was OK for a good few years after that but then it came back and within two weeks she was gone,” he said. The research is really important. We want to see students getting grants and scholarships so they can do the research. We’ll see if they come up with anything though they already have with the likes of colon cancer so we’re getting there. The route took the small group fourteen days to complete, travelling over 1700 miles on Betsy the tractor. “It’s something a bit different, it seemed like a good idea at the time and we got away with it,” Curran said. Curran said the group are considering travelling the route again next year to raise more money for the charity. The Kerry farmer’s contribution will go towards the Irish Cancer Society’s total €2.5 million investment in cancer research in 2012. The Fellows and Scholars awards are designed to foster home-grown cancer research talent in Ireland and to ensure new research projects are commenced in a range of cancers including breast, oesophageal, colorectal, gastrointestinal and prostate cancers. The research projects span a wide range of research areas and will investigate a number of potentially important topics, such as the response of cancer cells to chemotherapeutics and how they interact with our immune system. Cancer is a major cause of death and illness in this country and each year there are over 25,000 new cases diagnosed as well as over 7,500 deaths which accounts for almost 25 per cent of the annual national death toll. Cancer rates are expected to increase and it is estimated that by 2020, 40,000 new cases of cancer will be diagnosed in Ireland each year. Email “Kerry farmer raises over €20,000 for cancer research grants”. Feedback on “Kerry farmer raises over €20,000 for cancer research grants”.